1st Monday of the month @ 7-8pm, Mayhill Community Centre. 1st Thursday of the month @ 6.30-7.30pm, Gors Community Centre. 3rd Monday of the month @ 10.30-11.30am, Phoenix Centre. 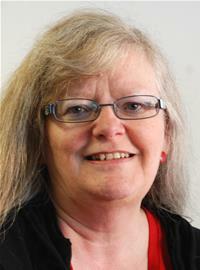 Lesley was elected in 2012 and has been a school governor ever since, currently at Dylan Thomas Community School. Knowing the issues which face the ward she is keen to promote the local credit union, formerly LASA, now My Community Bank, where members can get cheap loans and save money. She has been a Labour Party & union member, currently Unite, for over 30 years. Lesley is married with two cats and runs her own design & print business.